Arsenal great Robert Pires is convinced Unai Emery is the right man to lead the Gunners but says they need to eradicate their "strange" inconsistency away from home. Emery was hired as the successor to the long-serving Arsene Wenger at the end of last season and his first campaign at the helm has been mixed. After an impressive start to life at Arsenal, Emery saw his men begin to struggle and, for a while, they appeared in danger of missing out on the top four. But a sustained run of good form – including a 2-0 win over Manchester United on Sunday – has put them back in the driving seat for the final Champions League spot, while they are just a point behind third-placed Tottenham. And Pires thinks Emery is doing a solid job, though he did highlight the need to improve their record on the road, as Arsenal prepare to host Rennes in the Europa League on Thursday after losing 3-1 in France last week. 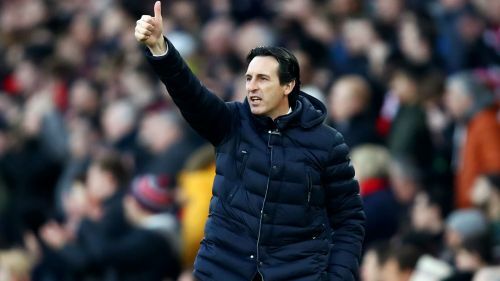 "I think yes," Emery told Omnisport, courtesy of Enterprise Rent-a-Car, when asked if Emery is doing a good job. "Of course, it was so difficult at the beginning for Emery. You know the fans, the media, they love to compare the past and the present, and of course, the past when you talk about Arsenal is always Arsene Wenger. "But he [Emery] is a great manager and his philosophy is good, [he is a] Spanish guy, so he loves to play good football, and look, we beat United at home. "We are close to the top three, just one point behind Tottenham and I think we can reach the seat for the Champions League next season. "It's strange, because it's my club and we have two faces. One face when we play at home, we play very good, we played sometimes well, we can beat Man United. "And the second face is when you play away and it's not the same team. That's why I say it's strange. "I spoke with Laurent Koscielny and even the players didn't know why we play so good at home and, not bad, but not very good when we play away. "Now, for Unai and the players, it's very important to find the good balance between home and away games." Arsenal struggled badly at Rennes last week, particularly after having Sokratis Papastathopoulos sent off in the 41st minute, but Pires is confident a turnaround is possible. "Out? No. Unfortunately we lost against Rennes, but Rennes played well," said Pires, who won two Premier League titles with Arsenal. "For the French football, it's a good news. Of course, not for Arsenal. "But we have the second leg at home, at the Emirates [Stadium], in front of the fans, so that's why I'm very positive. "I know it should be very difficult because Rennes have a good advantage, but if we play like against Man United, I think we can beat Rennes." Even if Arsenal do not make it all the way to the final for a second successive year, Pires – as an ambassador – will be there in Baku. He added: "I'm ambassador for Europa League, for Enterprise. I went to Baku to see the stadium, the people, like for the organisation for the final. "I met the sponsors, the fans. That's why I'm very happy to be in this position, in this role. It's a new life, but it's a good life."